Have you ever walked into someone’s garden and just stood in awe? It could be a friend, family or even a colleague’s garden and you cannot seem to find any flaws whatsoever. Their grass is perfectly manicured, there is a proper theme in the overall garden design, there is no overcrowding even though spreading plants are there and it seems like it is just out of a fairytale; whereas your garden is barren and can hardly sustain itself. If you ask them how they managed to maintain their garden the way it is, chances are that they are most likely going to talk about their gardener or some company that deals with landscaping services. You decide to call them and no surprise, they are too expensive and you cannot afford to allow your savings to do down the drain like that. You decide to give your garden another try. You roll up your sleeves and you manage to get your seeds to turn into saplings. So far your garden design seems to be coming together. However, this was just the easy bit, the real test is maintaining your garden. If you are a beginner, you should continue reading on below since the remainder of this article will contain a number of tips for you to keep in mind when it comes to maintaining your garden. The most important thing you need to do is know your plants. It sounds silly but if you look up various gardening catalogs, they will advise you to be vary of invasive plants. Invasive plants have a tendency to spread outside its intended space and causing havoc for the neighboring plants. If you do plan on keeping invasive plants, you need to shift them to a location where they do not cause trouble for other plants. People who are beginners when it comes to gardening tend to go overboard when it comes to planting seeds and they do not leave enough distance between them. The mistake is not noticeable when the plants are still saplings but as they continue growing, they start overcrowding which can become a problem for all the plants involved since they are not getting enough air circulation or room to grow. So, it is important to create a proper distance between plants. Not dealing with weeds can become a serious issue, especially if they are allowed to fester for long periods of time. Weeds will spread throughout your garden and ruin all your hard work so remove any and all weeds as soon as you spot them. Another amateur mistake is not forming a proper soil base for your flower bed. If you add new soil over fertile soil, it will not hinder the growth of weeds at all. So, proper time needs to be taken out to carefully rid the flowerbeds of all weeds before you start replanting. 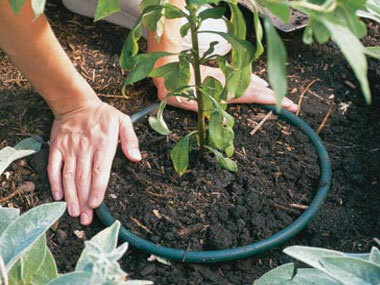 Lastly, do not go overboard with either watering or using pesticide on your plants. Too much of both of them will have a disastrous impact on them, so moderation needs to be practiced in that area. You may have wanted to pick up gardening for a number of different reasons. Maybe whenever you went to visit your gran, you would find her hunched over her garden, admiring her flowers or raking the soil to plant new seeds or picking summer fruits for you and now you want to do the same as her and follow her footsteps, as a way of keeping the memory of her alive. Maybe you want to start it as a hobby because you think that there is nothing more therapeutic or relaxing like digging your hands in the earth and creating something with your hands. The entire manual labor involved can become a good way to release pent up emotions and decompress. Another reason why you might be interested in gardening might be because you want to grow your own fruits and vegetables. In today’s day and age, our fresh produce is chalked full of various fertilizers and chemicals and you have no idea about the food you are putting in your body under the pretense that it is healthy and good for your body. Regardless of why you may want to start gardening, it can be a great hobby but there are some guidelines to follow or else you will end up with a barren garden and a lot of confusion and frustration. First of all, you need to consult at least 2-3 books on gardening for beginners where they will give you a basic overview of what to do and what you should expect during gardening. It will introduce you to a number of basic tools and seeds you should buy. If you read through the books, you probably know that you should get your soil tested so that you know whether it is fit for growing or if it lacks any specific minerals. Not every type of fertilizer will work for your soil, so it is important to find out what you are lacking so that you pick the right fertilizer to compensate for the loss. You should have a basic garden design in mind from the beginning. This layout will also help when you are shopping for plants at the nursery. You should not be tempted to just buy any plant so sticking to your pre-planned garden design will help you save a lot of money. Make sure to pick plants and seeds that are native. There is no point in trying to grow plants that will not strive in a certain environment. Taking care of weeds is crucial to your garden design. Weeds can ruin an entire garden if not removed early enough so pull them out of the roots as soon as you detect them. Using too much fertilizer will not do your plants any good. It will only poison them and kill the good insects that actually help to kill pests. So, some bugs in your garden are a good thing. Similarly, overwatering your plant will not do it any good. Water only the roots and find out the watering needs for each type of plant. Lastly, be patient. As long as you deal with your garden properly, you will soon see your garden bloom.